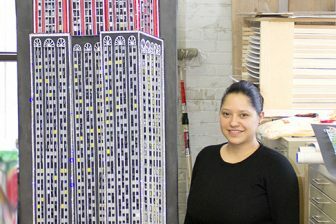 Artist’s Latest Contribution to the American Airlines Art Collection to be unveiled following American Airlines Broadway performance on The Terrace at Terminal 8. New Rochelle, NY – Internationally acclaimed 3D Pop artist Charles Fazzino and American Airlines will stand together on Friday afternoon, December 21st to unveil the artist’s latest creation: a 6 foot, by 6 foot, by 7 foot rotating sculpture of a model American Airlines airplane. The plane, which took Charles Fazzino more than four months to complete, pays homage to all of the destinations to which American Airlines flies from New York City. It is a stunning creation, typical of Fazzino’s signature three-dimensional and dazzling style. The unveiling will take place at approximately 2:50 in the afternoon in the main concourse of Terminal 8 at JFK International Airport following a double Broadway-performance hosted by American Airlines. The unveiling will punctuate the performances, meant to send holiday travelers on their way with joy and smiles. The airplane is the latest contribution by Charles Fazzino to an impressive collection of his works that decorate the terminal. 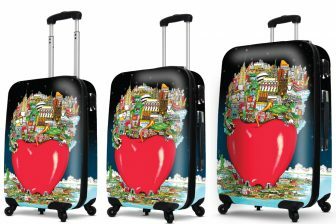 The collection is highlighted by a custom-created, original, three-dimensional, 13-foot mural that greets travelers as they go down the escalator to collect their luggage. The Fazzino mural art installation was commissioned in 2010. American Airlines Terminal 8 at JFK Airport combines the latest technology enhancements to offer a world-class facility for today’s travelers. The spacious Terminal 8 – which covers 1.5 million square feet – is the largest single-airline terminal at JFK. It offers two Admirals Club lounges and a Flagship Lounge, in addition to 53,000 square feet of retail space offering duty-free shopping and world-renowned brands. WHEN: Friday, December 21st at approximately 2:50 p.m.
American Airlines, American Eagle® and the AmericanConnection® carrier serve 260 airports in more than 50 countries and territories with, on average, more than 3,500 daily flights. The combined network fleet numbers nearly 900 aircraft. American’s award-winning website, AA.com®, provides users with easy access to check and book fares, plus personalized news, information and travel offers. American Airlines is a founding member of the oneworld® alliance, which brings together some of the best and biggest names in the airline business, enabling them to offer their customers more services and benefits than any airline can provide on its own. Together, its members and members-elect serve more than 900 destinations with more than 9,000 daily flights to 150 countries and territories. American Airlines, Inc. and American Eagle Airlines, Inc. are subsidiaries of AMR Corporation. AmericanAirlines, American Eagle, AmericanConnection, AA.com, and AAdvantage are trademarks of American Airlines, Inc. AMR Corporation common stock trades under the symbol “AAMRQ” on the OTCQB marketplace, operated by OTC Markets Group.